The Amarok’s performance is down to having so much torque available over a wide range of engine speeds. As you’d expect from the price tag, the 580 feels more like a luxury car than ute inside with its white-stitched leather seats, which are heated up front, and have electric adjustment, including electric lumbar-support adjustment, for both driver and passenger. The driver also has the benefit of both reach and tilt steering wheel adjustment; something that’s missing on many of the popular utes. The 580’s cabin equipment also extends to sat-nav, a reversing camera and dual-zone climate control among its long list of standard feature. As with all Amaroks, the cabin is extra roomy (the widest in its class) and beautifully finished. Good room in the back seat too, where the extra width comes in handy if you need to accommodate three adults. There are no airbags in the rear of the 580 however, or any Amarok for that matter, which is unusual these days given the focus on safety. Not only does this tuned-up V6 make what’s a very healthy amount of torque, but is does so from a very low rpm. In fact, all 580Nm is on tap from as low as 1,400rpm and doesn’t diminish until 3,000rpm. Having so much torque available over such a wide range of engine speeds is in fact the secret behind the 580’s impressive performance and flexibility. In general, driving the 580 is also effortless, smooth, quiet and refined. In fact, you would hardly know you’re driving a diesel. The eight-speed automatic, as well as helping with the engine’s responsiveness, is equally refined with shifts so seamless that you hardly know it’s changing gear. This is indeed a powertrain that would be as much at home in a performance-oriented luxury car as it is in a ute. The cabin includes sat-nav, a reversing camera and dual-zone climate control amongst its features. 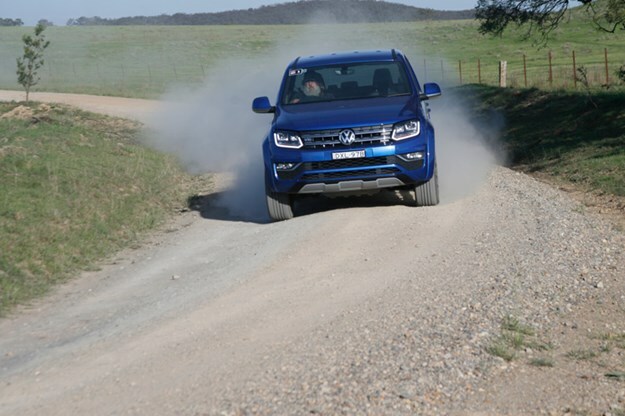 Compared to the other popular utes the Amarok feels ‘glued’ to the road, a feeling that’s helped by the excellent suspension control, and accurate and responsive steering. The 580 not only goes like a sports car, but compared to other utes it handles like a sports car! The low-profile 20-inch tyres also do the 580 no favours in any off-road situation, paddocks included, both in terms of ride and damage/puncture resistance, although one saving grace is that they are not notably high-speed-rated low-profile tyres, which are even more damage-prone off road. Better news is that the 17-inch or 18-inch wheels from the lower-spec 550 V6 models can be fitted to the 580 if your driving regime finds you regularly off sealed roads and you want a more practical and robust tyre. The road-oriented tyres aside, the 580 is however somewhat of an off-road weapon even without dual-range gearing. Better off road in fact than most of the popular utes that do have high and low-range gearing. What’s more, it’s brilliantly simple to drive. When going from on road (no matter what speed) to a tough off road challenge you don’t have to touch a lever, switch or button, as the 580 is always in 4wd; the eight-speed automatic and specially tweaked torque converter provide the equivalent of low range, while the centre differential automatically locks up if need be. All you need to do is point it where you want to go provided you watch the 500mm water wading depth, which is not as deep as most competitors. Bonus points too for the Amarok is that it is the only one of the popular utes that will take a full-size pallet between the wheelarches of the factory tub. 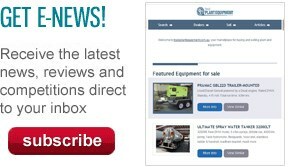 Why didn’t all the other ute manufacturers think of that? The fact that the tie-down hooks are where they should be, namely at bottom of the tub and not up high on the sides of the tub, also shows some clear thinking by the Amarok’s designers, as does the fitting of a work light above the tub and a 12-volt outlet in the tub. 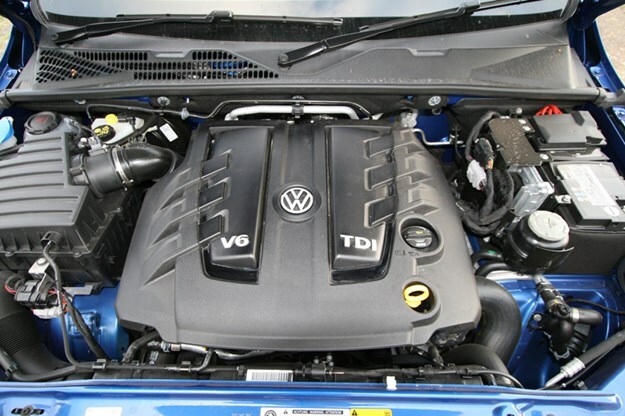 The Amarok’s performance is down to having so much torque available over a wide range of engine specs. There is no doubt that the 580 is a very impressive bit of kit as combines performance, handing, functionality and working practicality like no other ute. It is, however, expensive and lacks some high-tech safety features like autonomous braking that’s available on Ford’s Ranger and Mercedes-Benz’s X-Class ute. *Driveaway prices except for Ultimate, which does not include on-road costs.